J.D. 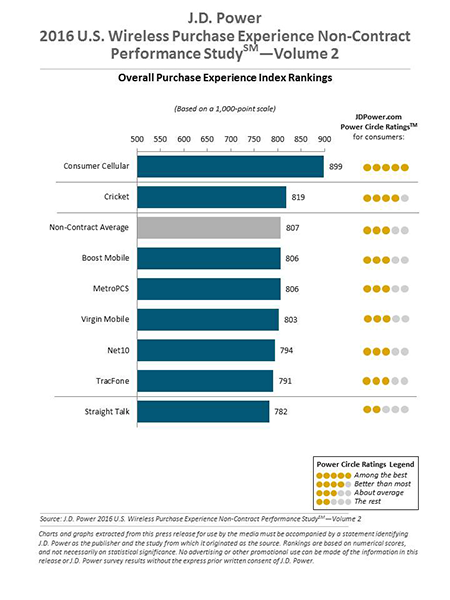 Power today released its report on wireless purchase experience satisfaction, and while T-Mobile didn’t win, it did do fairly well. This report on wireless purchase experience satisfaction evaluates the customer experience of making a sales transaction with their carrier. J.D. Power’s study measures six factors, which are (in order of importance): store sales representative; website; offerings and promotions; phone sales representative; store facility; and cost of service. In J.D. Power’s report, AT&T won with a total of 845 points out of 1,000. 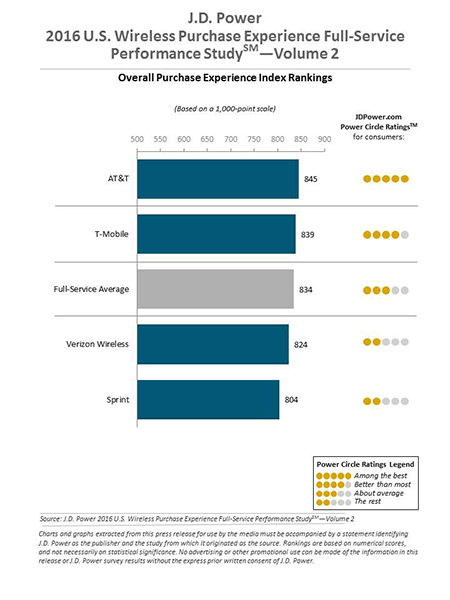 AT&T also won the first wireless experience purchase report of 2016. T-Mobile once again came in second place with 839 out of 1,000 points, beating the average of 834. Verizon came in third with 824 points, while Sprint finished fourth with 804 points. J.D. Power says that AT&T excelled in the store representative and offers and promotions factors. On the prepaid side, MetroPCS finished with 806 points out of 1,000. That makes it tied for third with Boost Mobile out of eight no-contract carriers. Consumer Cellular won out in this category with 899 points, while Cricket came in second with 819. Rounding out the no-contract group is Virgin Mobile with 803 points, Net10 with 794, TracFone with 791, and Straight Talk with 782 points. T-Mobile has done well in recent J.D. Power reports relating to wireless customer care, including a recent ranking on total ownership experience, and it also came in first in a recent Nielsen study on overall wireless customer satisfaction. T-Mo hasn’t quite been able to take J.D. Power’s award for wireless purchase experience, but it is coming in a close second place, which is still a good performance for Magenta. You can read J.D. Power’s full report at the link below. That fee is only for people who aren’t on any upgrade plans. (Jump, jump on demand) if you’re buying your phones for full price just get them from the manufacturer or best buy and save the 20$. Best buy doesn’t sell them and you can’t get them from the manufacturer. You would have to use eBay there should be no reason you can’t goto a store and ask to purchase a phone without a extra fee for no reason I only pay full price and I don’t pay for their gimmick services. And I don’t need their assistance worth anything I usually have to tell the employees about features and services and offers they don’t pay me. on top of that they already raised the price on most phones. You can’t get them anywhere but eBay? You can get phones outright from many different places. Off the top of my head Newegg for one. Samsung has their own store I’m fairly certain, Apple does. Any other retail electronics online store worth their salt will also carry unlocked and international phones. I only need Newegg though. Are they still charging the activation fee, aka mandatory $20 “SIM Starter Kit”? The worst part is that they don’t tell you about the $20 fee unless you ask or check your receipt. But please provide proof of this. T-Mobile phones come with SIM cards. At least every phone I’ve purchased from T-Mobile. And no, T-Mobile does not have activation fees. Contrary to what you would like to believe. When partner bought new phone a couple years ago – TM tsfrd everything to new phone and larger SD card. It took well over an hour. We would have paid $20 for that service. If you mail order from TM rather than store purchase, will they still charge extra $20? that’s great if you need that service and you want that service you can pay for it if you don’t need that service and just want to buy a phone you shouldn’t have to pay $20 to shop in their store. Good thing it’s an optional fee then right? Self service options are all over tmo. Is this fee mandatory or optional? We are not on finance plans – just walk in and pay. Always have bought the phones at TM. You trolls really have issues. VN I suspect? Yup it’s me! Hello fabulous Fabian.